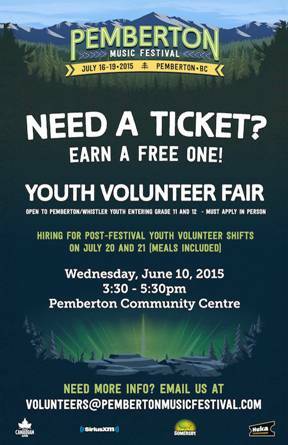 If you don’t have cash, you you do have time and energy, this might be your ticket to the Pemberton Music Festival. Volunteer Coordinator Stephanie Nicoll is hosting a recruitment fair for Pemberton and Whistler Grade 11 and 12 students. You have to apply in person and be available for a post-festival shift on July 20 and 21 – be at the Community Centre on Wednesday 10 June from 3:30 to 5:30.